Becca's dad, mike arrived on the wednesday evening after driving from Christchurch to Queenstown, where we were waiting in a rugby club car park, where we caught up over a bottle of wine, sat in his mansion on wheels! Not sure this was exactly what he had in mind when he imagined camping in New Zealand. Luckily he awoke early the next day and avoided the 9-O'Clock wake-up call we received by an angry council man banging on our window telling us we'd get fined if we didn't move in 5 minutes! For his first full day, we spent the morning on the gondola and luging. The gondola took us up to the top of the moutnain overlooking Queenstown and the surrounding lake and mountains with stunning views over the city. Luging is kind of like a cross between a sledge and a go-kart which you sit on a career down a windy track down a mountain. It was great fun, althougha bit too much for Hannah who was often overtaken by small children. We later discovered it was the most dangerous of all the acitivites you can do in Queenstown with the most accidents (bungy jumping was the safest). So Hannah obviously knew what she was doing when she took it easy! That afternoon we went to Arrowtown and Mike treated us to a pint in the appropriatly named pub - The Tap. That evening we followed the advice of every kiwi we'd ever met and bought a fergburger for tea. Quite possibly the best burger in the world and we'd reccommend anyone to try it. After that, we went out for another night in Queenstown (we wanted one we could remember this time). It was really good, we had a few leisurely drinks then found a live band in one of the bars which played lots of English songs. This was a good distraction for Laura, who had a big day coming up. Hannah and Becca had managed to persuade her to do a bungy jump, on the condition that they woudl do a canyon swing if she did it. Then she went up and paid the money and they soon regretted this when they realised that they'd actually have to go through with it! The bungy was off the Kuwarau bridge, whichw as the site of the first ever bungy jump and was a scarily high 43m - somethign which she was trying not to think about! It was a nervous morning, especially when she turned the corner and saw the bridge from the road (causing her to nearly crash and so flustered she put her windscreen wipers on instead of the indicator). The more she watched the other people jump, the better she felt about it. Therefore, when the time came for her to get into her harness later, she wasn't feeling too bad. It helped that a 12 year-old girl jumped off before her and didn't even bat an eyelid. After the initial thought of 'oh-my-god why the hell am i doing this?!' when she jumped she actually really enjoyed it and we were all very proud of her for doing it. We started our drive to Milford Sounds later that day and got as far as Te Anau, which was a pretty boring town. We spent the night piled into Mike's campervan, using his facilities - including a microwave - which definately beat our crappy gas stove! The drive to Milford Souds in the morning was pretty spectatular, although the windy roads through the mountains were interesting to drive on. We definately overestimated the size of Milford as we arrived at 2pm and by 2.30pm we'd done everythign there was to do there. This is quite typical of a town which is at the end of a road three-hours drive from any other civilisation. This resulted in a very uneventful afternoon and a very early night. We didn't mind however, as we had to be un early for our kayaking trip. 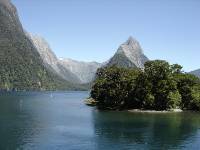 Milford sound is a basically where the sea has come in through the mountains and has created a huge lake in the valley. It's really beautiful and totally unlike any scenery we'd ever seen before. Kayaking was definately the best way to see it. It was really peaceful floating around and taking it easy after paddling past a 160m waterfall, we followed the rocks round and were looking at some seals when our guide spotted some dolphisn in the distance. 5 minutes later we were surrounded by about 15 dolphins, which stayed with us for about half an hour. They were swimming a couple of metres from the boat which was amazing to see and definately made the trip. It was our guides last day and he was especially excited to see them as they only ever come into the sound once every three weeks, so we were really lucky. We made a pretty hasty exit from Milford after our trip and started the drive back towards Queenstown as we had some activites booked for the next day. This included Mike doing White water rafting and Helibiking - both of which we decided weren't really our scene! Hannah and Becca had the dreaded canyon swing (thanks Laura!) which they spent the whole of Monday trying not to think about. and the whole of tuesday morning stressing about and hating Laura for. A swing sounds quite leisurely and enjoyable. Don't be fooled - we were suspended 300m above a canyon and suddenly released to plummet 120m free-fall before we were caught by the rope and swung to the other side. We'd decided to do this in tandem so we could cling on to each other and provide emotional support. The bus journey over the the site was made particularly difficult by their choice of music, all of which included references to falling or jumping, including U2 - Vertigo and 'I believe I can fly'. Hilarious. We also didn't appreciate being pointed out the bridge Laura jumped off and being told we were about to fall 3 times as far. Let's just say we were nervous wrecks by the time we got to the canyon. It went more smoothly than we expected in that neither of us refused to jump and remained reasonably calm throughout the whole experience. It was actually an amazing feeling after the intial panic and we would reccommend it, although we would never do it again! We spent the extortionate 95 dollars on the dvd and photos as proof of the jump and we were very dissappointed to discover that we got given a free baseball cap, instead of the t-shirt that Laura had got. That afternoon we had to say bye to each other as Becca went back up the west coast with her Dad, while Laura and Hannah went south to dunedin and up the East coast. It was a long drive from Queenstown to Dunedin for Hannah and Laura and we've learnt never to trust hannah when she says 'oh, it'll be fine' when regarding petrol - resulting in a few near misses. It was quite an exciting drive because of this, and the fact that Hannah had her first motorway experience! Needless to say they were in need of a drink when arriving at Dunedin! They checked into a hostel as we've learnt that camping in cities is impossible without a 6am wake-up which they didn't really fancy. The hostel itself was an interesting one. There was 4 other customers, all of whom were trampers and told us in great depth about their tramping experieinces. We somehow managed our third tuesday night out in a row - again, not too rocking, although it did perk up when they got talking to the owner of one of the bars and managed to blag free drinks for the rest of the night. The next day they experienced some of the culture of Dunedin, which is actualy a really nice city, known as the edinburgh of New Zealand. Hannah dragged a very hungover Laura around the art gallery, which she ended up enjoying. They decided it was a very good distraction from the hangovers. After powerade and pie (the new hangover cure) they felt a lot better and headed to the Otago peninsular for some penguin hunting. Although they didn't find any penguins here, they met a very cool seal whcih reminded them of Becca and was therefore named 'Fozzy'. They had more luck on the penguin front at a place called 'shag point' where Laura (future naturalist extordinaire!) finally spotted 3 of the rarest penguins in the world - the yellow eyed penguin! They were pretty cool and did a lot of waddling, which they found hilarious. The next day was a driving day, during which they stopped for a while in Ch.Ch. for a food stock up in the mighty 'pak'n'save'. Managed to actually find the art centre this time which we hadn't been able to locate on our last trip to Christchurch. The day after they finally made it to Kaikoura where they searched for a shower for 4 horus - turns out people in Kaikoura don't like us to be clean and wouldn't let us use their shower without paying for a room. That afternoon we all met up again. Becca and Mike ahd been busy exploring the West-coast for the past three days.It was really nice for Becca to catch up with her Dad during this time and she was quite happy to revisit all the hotspots of the west-coast including Ross and Haast! After we'd met up in Kaikoura, as it was Mike's last night with us, he said he would take us out for a pint and a meal. We had the world's best pizza - quite a luxury for us as we hadn't had pizza for months! (unfortunately we can't cook a pizza on a one-ring gas stove). The next day we woke up early to do one of the things we'd been most excited for in New zealand - a dolphin swim. We tried not to get our hopes up too much as we'd been told that for the last few days they hadn't been able to see any dolphins as the killer whales had been in. We got suited up in our extra thick double wetsuits complete with headpiece. Needless to say we looked very attractive and it was very difficult to move or even breathe at times. However, this was much appreciated when we jumped into the water and realised that it was absolutely freezing! We were in and out of the water about 5 times as the dolphins kept moving, although each time they were with us for about 15 minutes. This was absolutely amazing and none of us could stop smiling when they were circling around us and generally playing with us as we swum amongst them. We were told that dolphins would respond to high-pitched noises so we made fools of ourselves squeaking and singing to them. This did work though and Becca somehow discovered that they liked horse noises so proceeded to neigh - somethign which Laura found hilarious and nearly drowned from laughing at her. It was really hard for Bex to say bye to her dad but it was a really good day to end their trip together. It's been really nice having Mike over and hope that he has enjoyed it as much as we have! We are now in Picton, waiting for our ferry up to Wellingotn in the north island. We've got a week there before flying to Chile - something we are all slightly apprehensive about!